The 8-year-old started reading the “Harry Potter” books a few months ago; she’s finishing the last installment in the 30-45 minutes of extra awake time we give her after bath time. 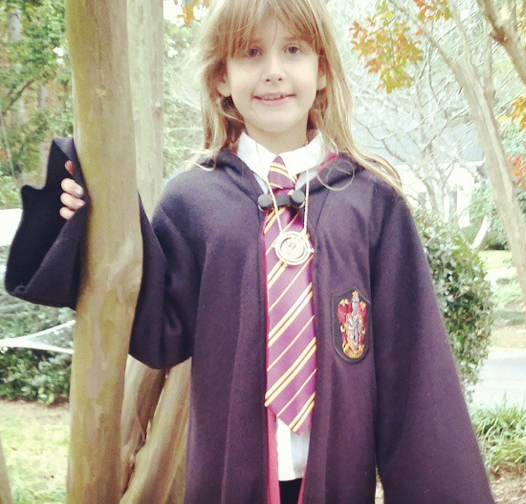 Naturally, she wanted to dress like Hermione for Halloween this year. So, we let her. But what about the rest of us? 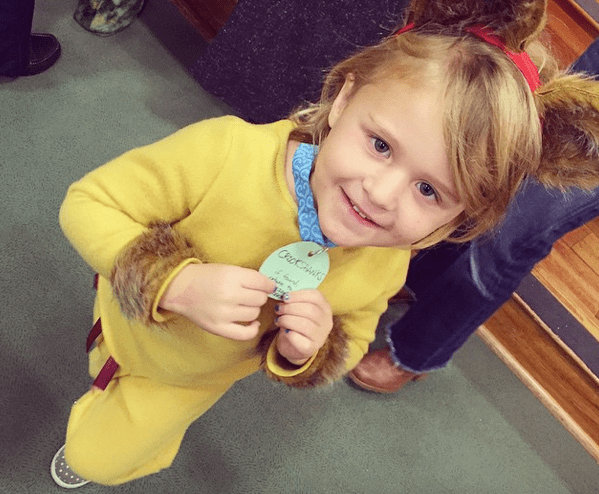 Her two younger siblings were not all that excited about dressing like characters from a book and movie they knew nothing about. And the youngest was convinced. Her mother created her costume. Making her brother play Harry Potter would have been the logical move, but he wouldn’t have it. 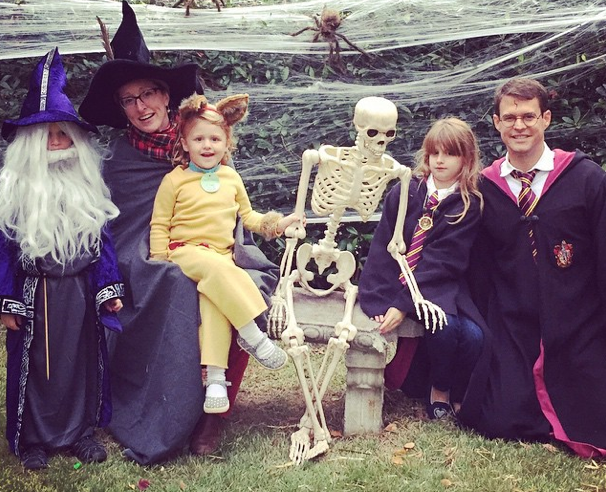 We parents volunteered to be Professor McGonagall and the famous Harry Potter. We had our crew. We’ve told Maddie she can see the movies after she’s read the last book, and we’ll surely use our Netflix subscription when the time arises. 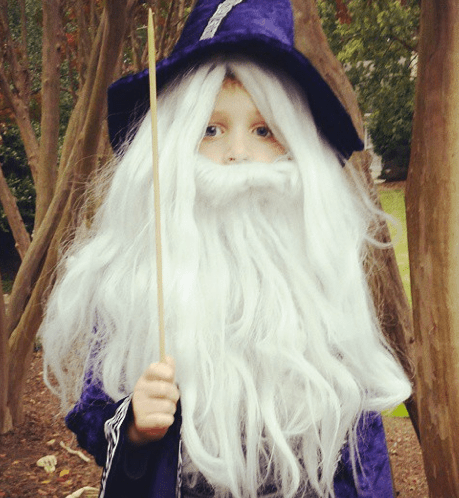 But while we were in the spirit of dressing young children as characters from pop culture they didn’t know, I decided to put Owen in some overalls and his Dumbledore beard. I gave him a shovel and told him to conceal one of his legs. And you know what? 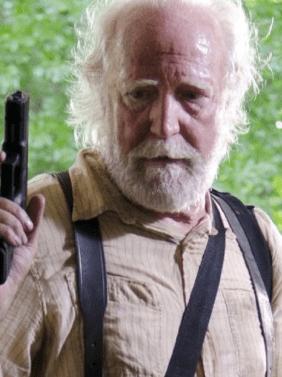 Instant Hershel, back from the (walking) dead. Hope y’all’s Halloween was as happy as ours was! You are a sick man. I can’t believe you lured our son out to potential zombie exposure in the pre-dawn schoolday hours just to get a photo of him for your blog. Sick, sick. 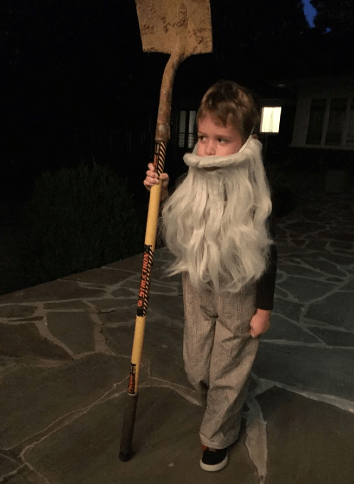 On another note, I suspect our years of convincing our children to all go in on a whole-family costume might be numbered. I won’t say as much to them, because it is my dearest desire that we all still dress up together when they’re in high school, but odds are pretty good they’re going to want to bail in the next couple of years. I am so, so glad we’re milking it while we can. These are the memories they’ll SAY embarrass them in their teens and twenties, but that they’ll secretly treasure and attempt to re-create with their own children. Good times. Good times.